Spending locally helps to recycle dollars in a city’s or region’s local economy. The benefits include stabilization for locally owned businesses, continuity in employment, more jobs, community pride and a sense of unity. We should do everything in our power to keep our money local. A Local Works! study in West Michigan showed that shifting ten percent to local spending created a huge impact to an area. 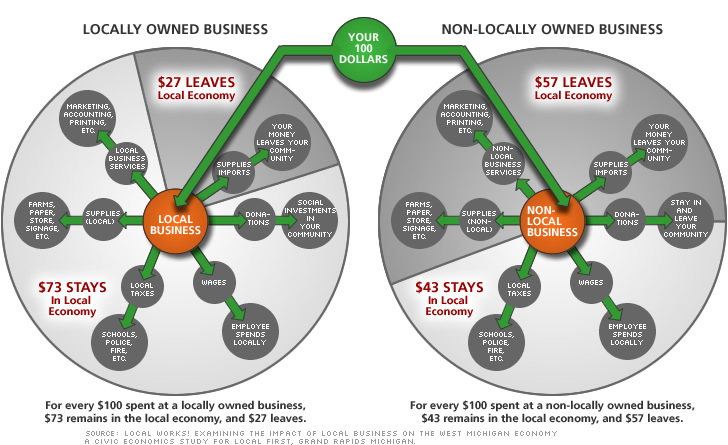 Additionally, it showed that when we spend $100 locally, $73 stays in the community as opposed to only $43 when we spend with non-local businesses. (see pie chart below) See the executive summary or complete study by Civic Economics. Any local city’s government has a responsibility to its constituents first, the residents and the business community within its boundaries. Initiating a Local First – Pompano First – campaign will help our local economy, support our locally owned businesses, sustain and grow local employment resources and help our community. In order for it to work, we will need participation from our residents, local businesses, and our local city government and its procurement department.